I just put up a video of my new(?) hot end design, using a FLIR thermal camera. I don't think I've seen this before. More to come. Edited 2 time(s). Last edit at 03/28/2011 02:44AM by jcabrer. That's really interesting to watch! Excuse my ignorance, but what surface is causing the reflection? And of course I have to ask - where can we find the plans for the hot end? I'm about to build my next attempt and am open to new ideas. wow. Great picture. I think Andrew's right about the range of your camera. I'd like to see a photo of your extruder. Looks like there isn't any heat dissipation going all the way up. 1 - 1/4" Brass Air Hose Coupling with 1/2" threading on the large end. 1. Drill a 7/16" hole at one end of the aluminum block, 1/2" from one of the the 3/8" x 3/4" ends, through the 1-1/2" x 3/4" side. 3. Cut into the hole from the 3/8" x 3/4" side. 4. Insert the #6 - 1" pan screw into the 3mm hole, and secure with the #6 lock-nut. This clamp will hold the heater block onto the brass air hose coupling. 5. The power resistor can be mounted in a couple of ways. You could screw it into the top of the block with a couple of M2 screws, but my preference is to use the table saw to cut a 10mm slot into the top of the block, at the opposite end from the tip clamp. The slot is just a hair narrower than the power resistor, and about 4mm deep. Once the slot is cut, apply a little heat sink compound, and use a vice to press the power resistor into the block. 1. Clamp the brass air hose coupling in a vice, and thread the narrow end of the coupling with your 7mm tap. 2. Clamp a block of wood, or scrp metal onto the drill press, and drill a 3mm hole into into it, close enough to the edge so you can insert a set-screw or two from the sides. Later, you will clamp your 3mm drill bit in this hole to drill out the center of the copper nozzle. Do not remove this block from the drill press unless you can make sure it goes back to the same position later. 3. Clamp the MIG welder copper tip securely into your vice, tip pointing down, so that the threads (not 7mm) and some of the smooth surface of the tip are exposed. Put a 7mm thread on this. Vice grips work here too. 4. Insert the copper tip into the drill press chuck, threaded end pointing down, and secure tightly. 5. Drill the copper tip down onto the 3mm bit. This should go into the center of the nozzle. Do not use too much pressure. The copper is very soft. Drill almost all the way through, leaving just 0.5mm - 1.0mm on the end. 6. Flip the copper tip in the chuck, and use the sand paper to sharpen the tip to a point. The sharper the better. 7. Screw the copper tip onto the brass coupling. 8. With the 3mm drill bit still secured in the block jig, mount the PTFE rod into the drill chuck, and drill a 3mm hole right through the center. 9. Running the drill press, take some sand paper, and sand a slight taper into half of the rod, up from the bottom. 10. Using the same technique, sand down the last 10mm of the PTFE to a diameter of 3/8". This part will fit snug into the bottom end of the coupling when heated. 11. Screw the PTFE into the brass coupling, using a pair of pliers to hold the PTFE. It should not be really tight. The PTFE will expand when it warms up. 12. Drill another 3mm hole into the block for the thermistor, but don't go all the way through. Insert the thermistor, and secure using the Kapton tape. Use shrink tubing to insulate the thermistor leads. My version of the Wade's Extruder had four holes coming into the hot end hole from the sides. I don't know much about where this came from, but I assume this was for mounting a piece of PEEK on some other hot end design. I used four set screws to clamp on to the PTFE here. This compressed the 3mm hole in the PTFE, so I put the whole thing on the drill press and reamed it out abit. Apart from these four set screws, nothing else holds my hot end onto the extruder body. Really! 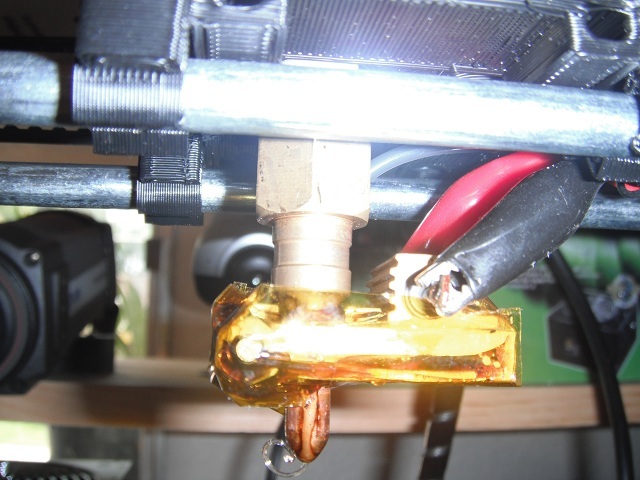 I have not had any problems with the hot end falling off, and even when it's hot (250C), there is little or no movement, or warping. I'm going to see if I can get a view of the PTFE with the FLIR camera, and see how hot it's getting on the mounting end. Use the alligator clips to connect directly to the power resistor on either side. I'll try and get a version of this with picture up when I get a chance. Enjoy! Awesome! - thanks for posting the info. The scaling is mostly linear, so the hot end is very bright compared to everything else. This is normal. I could equalize, but the image would not look so good. The apparent lack of heat traveling up is a result of the brass having a high emissivity value. Aluminum also has a high emissivity, but it is covered with the Kapton tape, so we are able to see the temperature there much better. I've got a video showing the hot end warming up from 20C to 210C. In it, the very top part of the PTFE can be seen, and whaen the nozzle is at 210C, the PTFE temperature is stable at 127C. Edited 1 time(s). Last edit at 03/27/2011 03:53PM by jcabrer. Great post! Excellent detail and brilliant use of FLIR camera. I also like the lateral use of off-the-shelf parts. I look forward to any more detail with the FLIR camera, and maybe even some more photos, when you get time. Great Post, may be you can post a normal picture of the hotend? Should be interesting to compare the two. That's the Up! 3d printer: http://www.pp3dp.com/.